What makes a computer case special? Is it because it has plenty of storage space or lots of fancy lights? Maybe it is for the reason that it is great for water cooling? All these questions and more must be answered when purchasing a computer case. 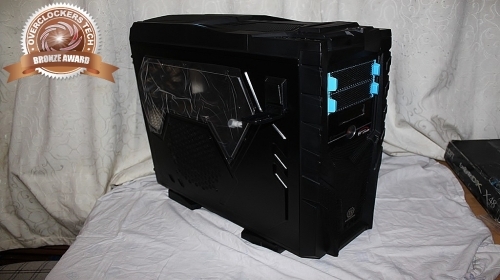 We at OverclockersTech have reviewed many computer cases ranging from the unusual Lian Li T1 Spider chassis. To the enormous Coolermaster Haf X and the Thermaltake Level 10 GT. Now we bare the latter mentioned cases in mind and then finally throw in the behemoth-like ‘Mountain Mods’ cases into the mix and the result is an interesting brew indeed. A few short months ago our very own ‘Lvcoyote’ gave the Thermaltake Chaser MK1 a gold award and when reviewing this product with the eye of air cooling, and it richly deserved our coveted award. However, let us now review the same product but looking at it from the viewpoint of a water cooling enthusiast! Will the product still receive a gold award even when factoring in its great air cooling potential? Or will it slip down the scales slightly? Only an in depth review from a water coolers viewpoint will reveal the truth. Here at Overclocker’s Tech we have two sides in the industry. We have our esteemed fellow reviewer ‘Lvcoytote whom is our ultimate guru when it comes to air cooling and yours truly for water and the more exotic forms temperature control. With this in mind we have decided to once again review the Thermaltake Chaser MK1, however ‘we have a twist in the tale’, as this time we are taking a look at the LCS (Or Liquid Cooled Solution) version of the same case.